Our residential security doors are high quality products made by the best in the business. Among our suppliers is Superlock from Israel where security and protection is a matter of life and death. Don’t rely on just any company for securing your business. M&D technicians are especially trained to install security doors to protect both your real and intellectual property. Our technicians are especially trained to install security doors for both your home and business. We use the best names in the business including Superlock from Israel where security is a matter of life or death. Your doors may not be the likely entry point for a burglar, but it will often be the first place they look. If your doors are not secured well enough, it can give a thief just the incentive he needs to break in. Let M&D Locks and Keys help you protect your family, belongings and business with our ultra-strength security doors. M&D Locks and Keys is more than a locksmith service. We install security doors and gates that are guaranteed to prevent break-ins (check with us for all warrantee and guarantee information before purchasing your door). We offer a wide selection of doors and can even have one custom made to fit your home beautifully and with top level security. We carry all leading brands of doors and hinge equipment as well as all locking mechanisms. M&D can even secure and retrofit your old, vintage door to prevent break-ins. As with all home security devices, give us a call at (718) 484-4050 to set up an appointment to have one of our security door installation experts come by, inspect your entry way and give you a quote. He or she will provide you with several options with various high quality materials and prices. We’re certain there is a top security entry system within your budget. Depending on the level of security you want, the shape and size as well as the material, the right door for you can be any of those listed below. It can also be a variation of several or a completely handmade custom door. Ask your M&D security specialist which options are right for you. Often it’s the first thing your guests will see. Your front door is like a first impression so you want it to be beautiful and welcoming, but also a deterrent to any of the bad guys looking to break in. There are many standard door frames, shapes and sizes so chances are you will be able to find one without having it custom made. This means you’ll likely save money and still get a high quality entry way that you’ll love. The door will also come with many different security options and you will be able to choose what kind of locking mechanisms you want to have. Front doors are also very adaptable to home security systems and surveillance units. We’ll have plenty of choices for you. You’ve seen these. They are the thick iron screen doors that are placed in front of your front door or back door. They are often just as secure as any door in the house and very difficult to break. You’ll be sure to discourage intruders with a security screen door. Screens are especially useful during the hot New York summers because they allow you to let a cool breeze inside without risking unwanted intrusion. They come in all sorts of shapes, colors and sizes and have advanced considerably in design over the years. Today’s security screen doors are both very attractive and secure. These are the sections on each side of your front door that are usually there for an enhanced look and to add natural sunlight into your home. Indeed they are very luxurious, but are often easy access points for intruders. We recommend incorporating a security alarm system when you have sidelights, or use faux glass that cannot be broken for access. 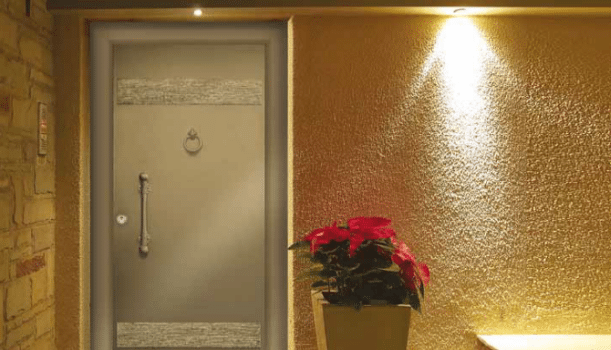 Security sidelights can be incorporated if your entry way is wide enough and will help to deter break ins, but be sure you tell your M&D security expert about your security requirements if you are considering sidelights. He or she will have some specific recommendations. Double doors are exactly as you would imagine. Instead of one door, you have two. Sometimes one of the doors is stationary or set in a fixed position while only one side is used for entry. This does not have to be the case and we often sell double doors that are fully functional as well. Though a single door is usually sturdier and therefore more secure, double doors can still provide a high degree of elegance while providing top security as well. They come in multiple shapes, sizes and colors and offer a large assortment of designs. They are the most luxurious of all doors and can really enhance your home’s entryway. Storm doors are very similar to security screen doors and are usually incorporated to allow for a second layer of security as well as protection from harsh weather. Since they often incorporate a screen, they can be used to help with ventilation during very hot weather as well. One of the advantages of storm doors is that they usually allow for interchanging glass or screen panels that can be used for different weather conditions, provide for various levels of visibility and prevent bugs from entering the home. It also protects your front door from bad weather and harsh elements. To ensure your door is secured properly, only have an experienced and certified security door specialist, hang, hinge, set and rehang your doors. An improperly hung door can create security problems. Finally, our skilled professionals will make sure that all hinges on installed doors are properly balanced on their frames. All our doors come with top quality knobs, handles and locks that ensure maximum protection and ease of use. Our hinges and locks are manufactured with the premium alloy materials, making them durable and strong. Other features can be incorporated as well such as protection bars, high security locks, heavy-duty hinges, hinge protection bolts, and spy holes.